I spent much of August on a 7,000 mile road trip that took me from Texas, to Colorado, to South Dakota, to Montana and Wyoming, back down through Utah to Nevada, then across Arizona and New Mexico back to Texas. The plan was for it to be a “working vacation”, but getting connected to the Internet proved to be much more challenging than anticipated. In part one of “Lessons from the road” I talked about the unreliable Internet access offered by hotels. The reality I experienced is that the “free Wi-Fi” or “free hi-speed Internet” were often disappointing at best—assuming I could connect to the Internet at all. The map looks quite red, but the reality is that 3G is unavailable in much of the country. Thankfully, I had a “Plan B”. Armed with my iPhone and iPad using a shared data pool from Verizon, I figured I could simply set up my mobile devices as a Wi-Fi hotspot in order to connect to the Internet while on the road, or for situations where the hotel Internet access left a little to be desired. That was the plan at least. Reality was a tad less cooperative. 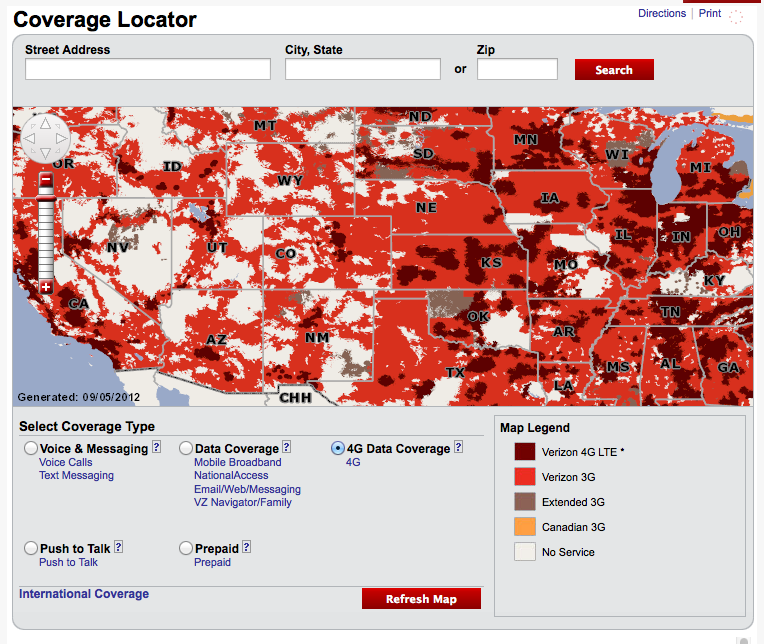 If you look at the map of Verizon coverage, it seems to be mostly red. At first glance, it looks like I should have been able to connect using my mobile devices as a Wi-Fi hotspot from just about anywhere my travels took me. The coverage map is misleading. I ran into two problems with my cross-country travels. The first one is that coverage is much more spotty than the coverage map seems to indicate. As long as we were near any town with a decent population, or traveling down a major interstate highway I didn’t have a problem. But, venture off the beaten path onto a two-lane state highway and you can pretty much kiss that mobile data goodbye. Much of our trip involved mountainous territory, which exacerbated the problem. While a given area—like Denver—might have solid 3G or 4G coverage, whether or not you can connect to it depends a lot on your elevation and line of sight to the cell towers. When we drove up to the top of Mount Evans I had absolutely no signal most of the way up. Even standing in the parking lot at the top, I could not get a signal from Verizon. But, once I hiked up a hundred feet or so above the parking lot I suddenly had a solid 3G signal again. As we drove through the Rockies, the Badlands of South Dakota, and Yellowstone National Park the ups and downs of traveling through mountainous terrain made it virtually impossible to maintain a consistent, stable connection over the Verizon network. The second problem I had is that 4G is virtually non-existent across most of the country. If you look at the coverage map, you’ll notice that the darker blotches indicating 4G access are very few and far between. Basically, if we weren’t near a major metropolis there was no 4G available, and even when we were the odds were slim. If I was still with AT&T I might not mind as much. AT&T’s 3G is the HSPA+, pseudo-4G kind. It may not be real 4G, but it’s sufficient, and it’s far superior to Verizon’s 3G. In most places Verizon’s 3G provided data so slow it made me want to throw the phone out the window. Verizon’s 4G is nice…when it’s available. My iPad averages somewhere around 15Mbps over the Verizon 4G connection. Verizon’s 3G, on the other hand, is virtually useless. It reminds me of using 14K dial-up back in the day—and that’s not a good thing. For intrepid road warriors hoping to connect and get work done using a mobile hotspot or a mobile device acting as a hotspot, don’t count on it. The only places that really works as advertised are the areas where you need it the least—highly populated areas filled with McDonald’s and Starbucks every 100 yards where you can access free Wi-Fi anyway. If and when the major wireless providers deliver 4G to all of the places currently covered by 3G it will be much more feasible. Even then, though, it seems like there are more places where mobile data doesn’t work at all than there are places where you can use it reliably.